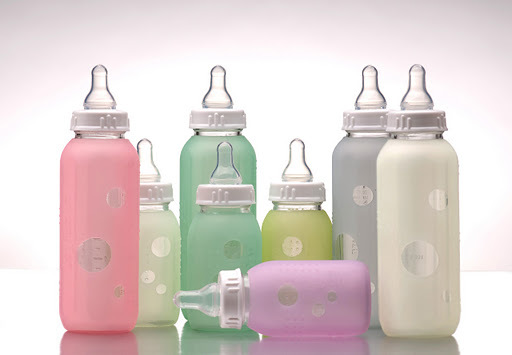 We have compared and reviewed baby bottles on this blog. But we forgot to recommend Silikids Siliskins . If you use a glass baby bottle such as the Evenflo Classic Clear glass nurser simply slide on the custom silikids silicone sleeve. The innovative sleeve allows babies to grab hold and avoid slippage when feeding from a glass bottle encased in a colorful siliskin. It is microwave safe, keeps heat from transferring from bottle to hands, hypo allergenic, and dishwasher safe. This translucent silicone sleeve allows you to see measurements and liquid in the bottle. Cleaner than any plastic, glass bottles are the best. The secret is silicone. It is safe, pliable, and stylish. Due to recent concerns regarding BPA, many parents are switching to BPA Free children’s products. Silicone offers just that solution. Silicone does not contain toxic chemicals like bisphenol-A, lead, PVC, and phthalates. Silikids Siliskins is basically made up of silicon, a natural element present in sand, quartz and rock, which, after oxygen, is the most abundant element on earth. Silicon is transformed into silicone when combined with oxygen, carbon and hydrogen. Because it is an inert material, it does not react with food or beverages, or produce any hazardous fumes. It’s non-toxic, hypo allergenic, does not promote bacteria or fungus growth, and it does not transmit taste to food. Silicone does not decompose but it is recyclable — although probably not through your city-wide recycling program. There are many specialty recycling facilities that recycle silicone. (Send your Silikids products back to the company and they will recycle it for you!) Silicone is very durable so you won’t have to worry about disposal for a long time, thus promoting reuse and less waste. * Silicone is hygienic and hypoallergenic. Its rubber like material is safe, durable and pliable, there are no open pores to harbor bacteria. * Silicone is easy to use and to clean. Microwave or freezer safe/dishwasher and washer and dryer friendly. * Silikids products are all made from food grade silicone. * Silicone does not fade or scratch. This seems like it would be good on glass bottles- as it would help for bottle to not break if dropped.However, I have read that if you start to let babies hold their bottles- they got more attached to them- because they have full control on it- and feel like it is 'theirs'- thus making it harder to break them off the bottle.I tend to agree- as I have had two charges who have been like that- bu they were girls- so not sure if that is the reason- as girls are more persistant- IMO- as opposed to the boys who I have cared for and did not have to much interest in holding their bottles and when it came time to stop bottles they seemed like they did not care as much as the girls did.